"He thinks you’re beautiful and perfect exactly the way you are." 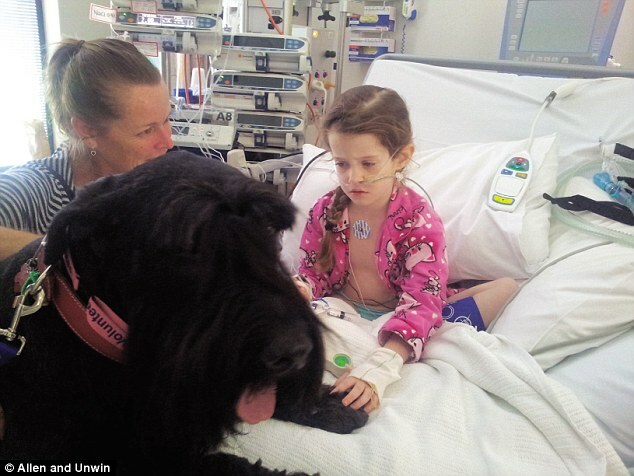 A very special therapy dog bringing joy to hospital patients around Melbourne is proving that a dog certainly is man's best friend. 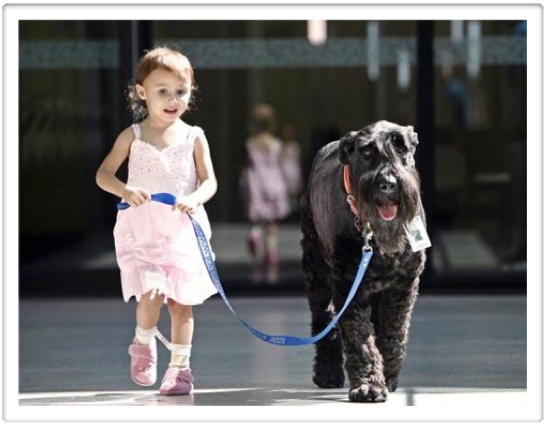 Ralf the Giant Schnauzer was adopted in 2005 by the Lovick family, who quickly realised that their new dog was much more than just a pet. The gentle giant has been visiting sick children and aged-care homes for nearly ten years, bringing his special brand of magic to the people who need it most. 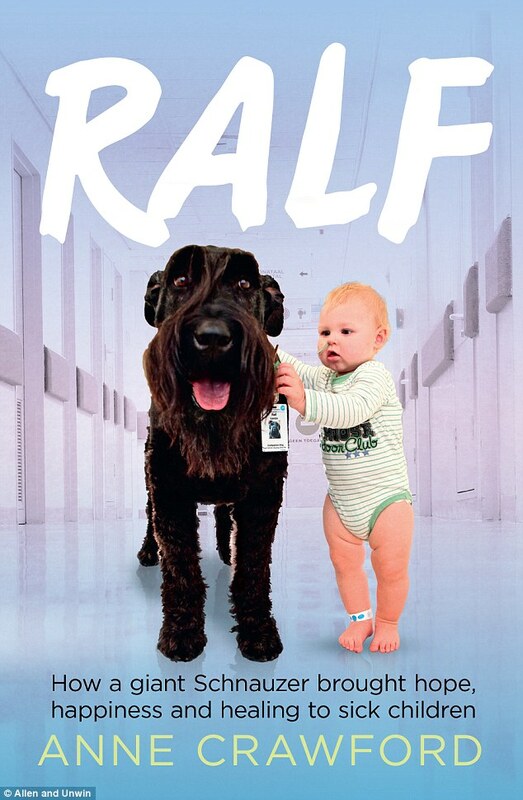 A photograph snapped a toddler (a patient at the RMCH) walking alongside his huge furry friend quickly made the rounds in both local and international media, shooting Ralf to fame and raising awareness of the work that the RMCH does. 'Everybody knows what it feels like to have a bad day. Ralf is happy to be your friend and have a hug. 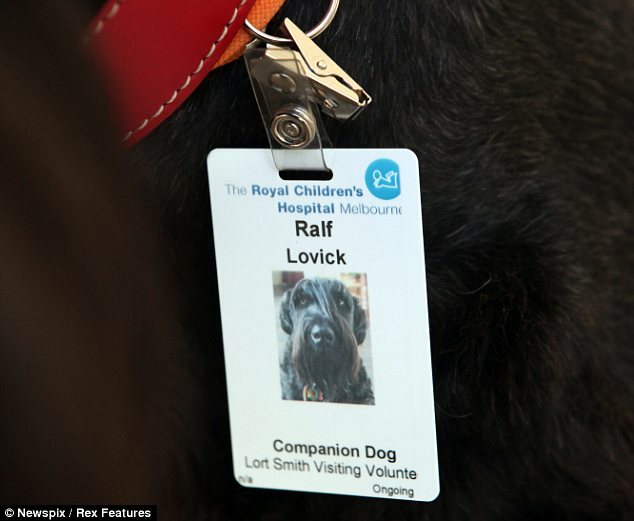 He thinks you’re beautiful and perfect exactly the way you are,' Ralf's owner Caroline Lovick. Ralf quickly became a regular visitor at the Trinity Manor family owned aged care home in Melbourne, visiting the residents for up to six hours each week and bringing a smile to the faces of many who lived there. Ralf visits the residents in common areas, in their rooms, even in the centres hair salon, offering companionship and quiet solace and even sparking memories in some of the patients suffering from dementia. Ralf turns 11 this year, which is 'ancient in Giant Schnauzer years', and suffered his own health scare when he was diagnosed with arthritis and cancer in his toe. Caroline said that while she knows Ralf won't be around forever, she has treasured the moments she has shared with him and the people they have met, and is incredibly proud of the work Ralf has done. ‘I feel completely spoilt and privileged that I go to work with Ralf- I’ve loved every minute of it,' Caroline said. 'It’s a little window, a nugget and it’s not going to last forever. I feel so incredibly lucky to have Ralf in the world’. RALF by Anne Crawford, published by Allen & Unwin is on sale 25 Feb 2015.